Majoon Mithai is a dryfruit and mawa (Khoya) based Sindhi Mithai. The recipe varies from family to family. While some use water and sugar syrup, others prefer to cook a mixture of milk and sugar and then add other ingredients like poppy seeds, dried coconut and Mawa to make this decadent dessert. 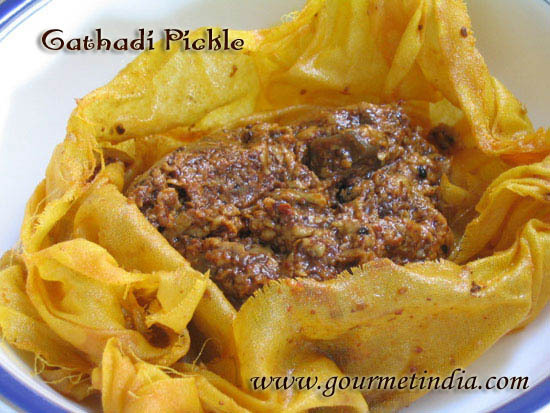 This particular recipe is of my friend Priya’s mother-in-law. A rich dessert like this, is ideal to be consumed when temperatures are low. Go ahead and experience this wonderful marriage of rich and delicious flavours in a traditional Sindhi mithai. 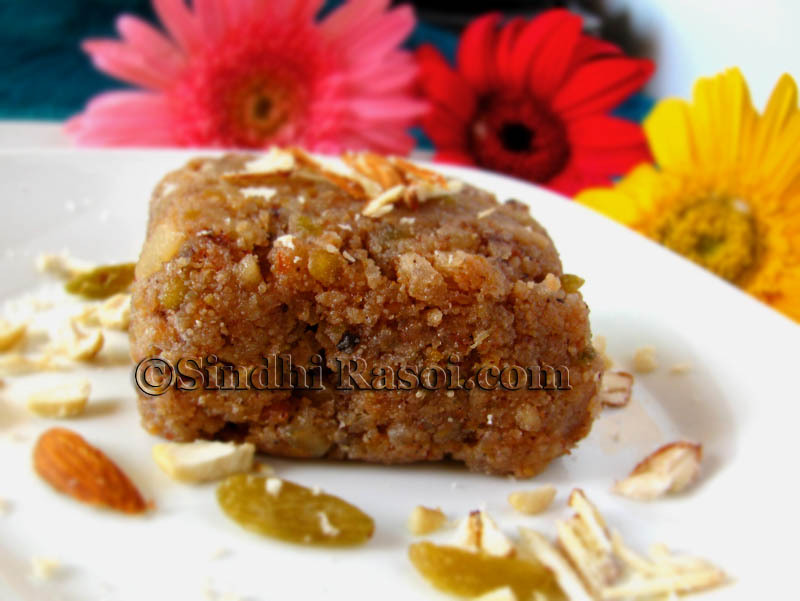 Majoon Mithai is a dryfruit and mawa (Khoya) based Sindhi Mithai. Take a thick bottom pan and heat milk. Add sugar and stir frequently. Let the mixture boil and thicken a bit. Add cardamoms. Add poppy seeds and stir vigorously. The seeds will swell up and start to soften in a while. Meanwhile take another pan, melt the ghee and add the mawa. Roast it for 1-2 minutes (do not let it burn), and add grated coconut and coarse Chuhara. Mix well and add the milk-sugar-poppy seeds mixture. Beware of the spluttering. Add chopped nuts and mix vigorously till the mixture is light golden brown. Cook till the mixture leaves the sides of pan. Switch off the flame. Take a greased tray or plate and spread this mixture. Cool and cut into squares. You can garnish Majoon with silver warq (Varq) or serve as is it. Stays well in refrigerator for at least a week. Before serving, you can just heat the Majoon with 2-3 tsp of milk on low flame. Wow thanks for the Majoon recipe.I love sindhi language,culture and its cuisine.I want to learn Sindhi language can you help me. Eeee! 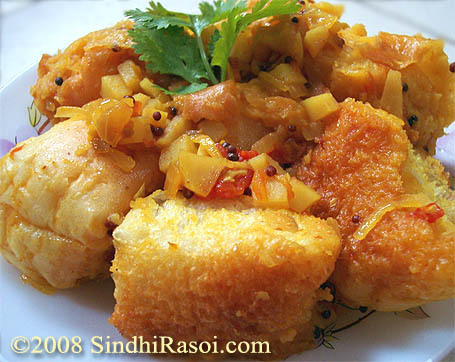 All love to Sindhi dishes! And also love from Sindhies across the boarder from the land of Sindh here in Pak. You guys are doing excellent job promoting the richest culture among the world. I didn’t know there were several other dishes I was unaware of .. Very nice. Will surely try this recipe. Yes I know ! My Nani taught me. Very nice site and essential to be known to all sindhis. Thanks a lot for creating this site. I am grateful to you for writing Sindhi recipes.Love them and though I know them but it is a godsend for our future generations. Thanking you for your good work. Varq is hair thin silver foil. Mawa is made from MILK by slowly getting rid of water. Alka Ji, my Nani taught me how to make majoon when I was young & didn’t have enough sense to write down the recipe. She has passed away & I didn’t know how to bring back the recipe. 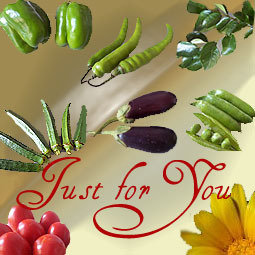 Your blog today is Godsend, don’t have words to express my thanks to you for keeping the authentic sindhi recipes alive.